“Eggplant, aubergine is the king of vegetables (actually fruit, as it has seeds) at home; we must have over 200 recipes featuring our beloved eggplant. I made a twist to the eggplant boreks at home, this time grilling the eggplants with the skin on and using the lovely soft flesh. The result was a wonderful marriage of smoked eggplant flesh with sweet onions, tomatoes and mozzarella (you can also use mild cheddar cheese instead). These pastries would make great vegetarian appetizers; they are also lovely served with garlic yoghurt by the side. Sauté the onions with some olive oil for a couple of minutes, until soft. Add the tomatoes and cook for another couple of minutes, until most of the liquid is evaporated. Stir in the parsley and season with salt and pepper. Once cooled, add the cheese and mix well. Check if more seasoning is needed, set aside to cool. Place the sheets of filo on a flat surface and cover with a damp dish towel to keep moist. 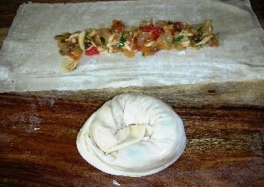 On a dry surface, place 2 fillo pastry sheets on top of one another and cut in half horizontally to form two rectangles. Place 1 tablespoon of the mixture in the middle and roll like a cigar. Then, starting from one end, roll the cigar shape into a rose shape sealing the end with a little water. Make sure you seal all the openings/cracks with a little water. Repeat this with all rectangles. Mix the egg with the olive oil. Brush the boreks with this mixture and place them on a greased tray. 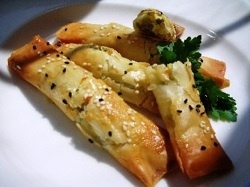 Sprinkle sesame seeds over the boreks and bake them in the oven for about 25 minutes or until golden. Serve immediately with a leafy salad or garlic yoghurt by the side. 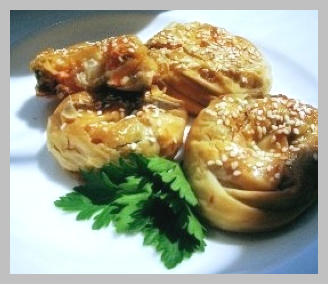 Ozlem Warren is the winner of our Turkish Savory or “Borek” Recipe competition and recipient of Turkish Cookbook, Sultan’s Kitchen by Ozcan Ozan. Ozlem is not only a Turkish cooking enthusiast but also a culinary teacher of the Turkish cuisine from time to time. She lives in the UK and also spent some time in the US. She understands the challenges of creating Turkish recipes outside of Turkey, but also brings in what she learns from other cuisines into her cooking. She writes about her cooking and eating adventures on her blog: http://www.ozlemsturkishtable.com. Thank you Ozlem for the recipe and photos. Keep cooking and experimenting! Ozlem has it spot on! Eggplant is indeed a popular ingredient in the Turkish cuisine. Therefore, we are kicking off our new series featuring eggplant recipes on EAT. Our first recipe will be from Chef Metin from the Istanbul Culinary Institute!